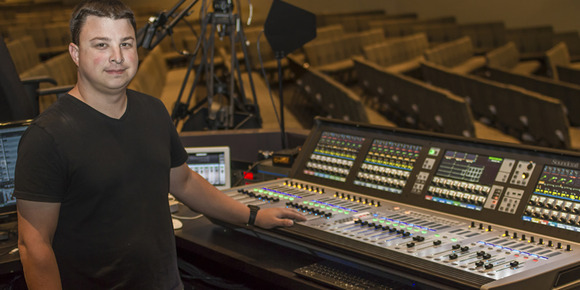 SCOTTSDALE, Arizona, USA - To streamline its Sunday services, rehearsals and weekly events, Highlands Church in Scottsdale recently acquired a HARMAN's Soundcraft Vi3000 digital console as part of a long-overdue audio equipment upgrade. As the previous system was constrained by its limited capacity, the Church now enjoys a massive amount of channels with the addition of a Soundcraft 64x32 Stagebox, enabling a more refined experience in the 1,500-seat sanctuary. In addition to the standard house of worship environment, the sanctuary also serves as a rental venue for some local nonprofit groups. To allow better access for volunteers and guest engineers from the local community, Technical Director Luke Taylor chose the Vi3000 console for not only its high channel count, but also its low total cost of ownership and ease of use. "After the capabilities of the Vi3000 were announced, I became very interested in the console for its value and accessibility of controls," said Taylor. "We were able to cut out a lot of analog equipment and cables from our inventory, streamlining the whole operation. I especially like hooking up via Dante for multi-tracking, so that we can stream live events on our websites." For Taylor, the Vi3000 console stood out from other brands thanks to its straightforward, analog-like design, allowing instant responses for operators. The Vi3000 is loaded with such features as separate output buses on every channel and Soundcraft FaderGlowTM illumination on each fader. "Since we have a lot of volunteer operators that rotate on a schedule, I really appreciate the fact that I don't have to tweak settings that are five layers deep anymore like with some of the other boards that I've worked with," said Taylor. "Features like FaderGlow are great shortcuts for newer users and definitely help me train them to become comfortable quickly while using the board. We wanted to see as many channels at one single time in a clear layout, and the Vistonics II™ touchscreen also delivered." Besides convenient features, the Vi3000 is renowned for superior sound due to its SpiderCore DSP engine with onboard Lexicon FX processing. "It sounds great," confirmed Taylor. "I like the preamps and the EQ's a lot more than some of the competitors. It takes a very short period of time to get everything dialed in and sounding the way I want it during rehearsals." For more information on Highlands Church, please visit http://highlandschurch.org.